Bifold windows and doors are designed to bring lots of natural light into a room and give the widest clear opening possible. Perfect for use internally or externally, the flexibility of the bifold window design allows them to function as either a window or a full height door. 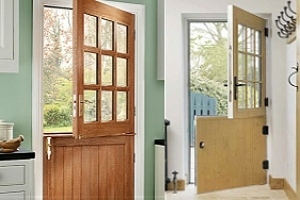 In the form of a door, bifolds’ are very popular to use in a conservatory, orangery or patio door. As a window not only do they “make a statement”, with the ability to slide completely to the sides and allow unrestricted views. They also work really well to connect between interior spaces, such as kitchen and living areas, whilst being particularly suited for use as a corner window. Constructed from a series of side-by-side glazed panels (sometimes referred to as panes or leaves) that have hinges on the vertical sides, Bifolding windows and doors are operated by releasing the locks and then sliding the panels to the side of the window frame. As the panels slide to the side, they “fold” into each other (like a concertina effect) and stack tidily either to the outside or inside of the frame. The panels can be slid left or right or you could decide to have some moving left and some right. 1 Bifold Window & Door Design Features? 2 Why fit uPVC Bifold windows or Doors? 2 How much do Bifold windows & Doors Cost? Bifold window & door design features. What do they look like, how do they work and what are the differences between Bifold window & door versions? A bifold door functions in exactly the same way as a bifold window, but uses glazed door panels in place of casements. Once folded to the sides, the panels can “sit or stack” either to the inner side or outer side of the main frame. The main objective of both versions is to leave the maximum amount of clear space once the unit is open – in this case it, up to 90% of the aperture remains unobstructed when the windows or doors are fully opened. When closed, they look just like a regular patio door or casement window, it is the opening function that sets them apart from other designs. Both of these versions can really make a room feel spacious because of the wide open space they create, due mainly to the absence of centre frames or mullion posts that you get with other window designs. Typically, Bifolding designs feature an outer frame in which the door or window panels are housed. The panels themselves are attached to guide tracks at the head & the foot of the frames, one of which will be taking the weight of the panels. Either the upper or lower track can be designated as the loadbearing section. Where the upper track takes the weight the installation is referred to as “top hung”, and where the lower track is the loadbearing one, the installation is referred to as “bottom hung”. There are 2 types of frames; the outer frame and the sub-frame. 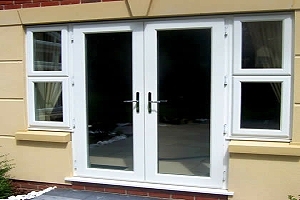 Sub-frames are the window or door panels themselves and can both be made from either timber, uPVC or Aluminium. Timber Frames / sub-frames: There are broadly 3 options for timber frames, hardwood, hardwood veneer or engineered wood. Hardwood is self-explanatory and is an excellent choice as it is a hardwearing, and naturally insulating, material that many favour due to the “natural” look and feel. Hardwood veneers are a combination of softwood frames with a thin layer of hardwood bonded to the surface. 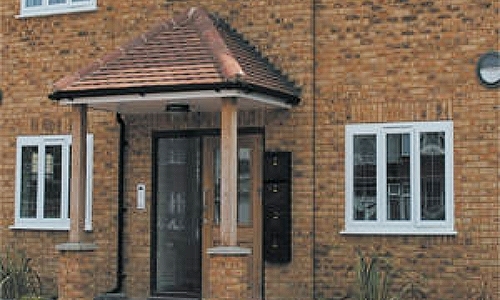 It’s not that common to see them used as external patio doors or windows. Engineered wood is virtually the perfect wood to use for this type slim framed window or door. Because it is composed of alternating layers of wood, it has no “grain” to speak of. This lamination of cross grained timber strands is extremely resistant to warping, shrinking or other “similar flaws” that wood is usually subject to. Aluminium Frames / sub-frames: With aluminium you get 2 options, all aluminium or aluminium clad (sometimes called aluminium composite). The full aluminium frame profiles are chambered to make them lighter and boost strength, but also within the chambering is what is known as the thermal break. 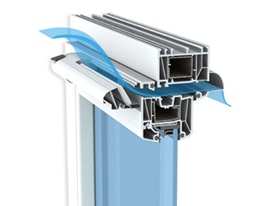 Thermal breaks for aluminium profiles used in bifold windows and doors are very important. As aluminium is a good conductor of heat or cold, there has to be a physical barrier built into frame profiles to stop any transfer. Aluminium clad bifold windows and doors don’t need the thermal break as the sub-frame itself is usually engineered timber (various softwoods or even European Oak) and an aluminium skin is then bonded to the external surface. The aluminium cladding is only on the outside and so cannot transfer heat or cold in or out of the property. UPVC Frames / sub-frames: Much like aluminium uPVC frames are chambered to make them lighter and stronger. Unlike aluminium, uPVC is a bad conductor and therefore uPVC bifold doors or windows don’t require the thermal break. UPVC is not as strong as aluminium, and so the outer frames and sub-frames can include galvanised steel internal reinforcing where necessary to create greater structural integrity. This is very useful for larger bifold door installations, where the larger doors can get quite heavy. What are the differences between Bifold windows & doors? 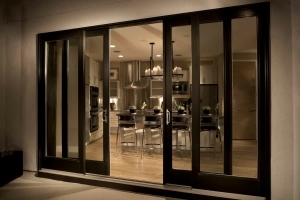 Apart from the obvious difference in size and purpose, the function and method of operation for a bifold door or a bifold window is exactly the same. The differences are only minor, one of them being the need for a threshold for a bifold door. 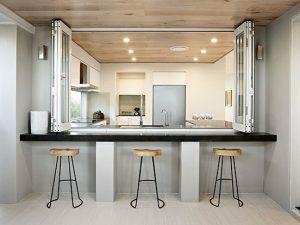 Whilst both designs have a bottom track, the height (or lack of it) of a bifold door threshold can impact upon how comfortable the unit is to live with on a day-to-day basis. A high threshold can be somewhat of a safety hazard as well an inconvenience, someone could trip over it and suffer an injury, especially concerning for children, the elderly & infirm or a wheelchair user. 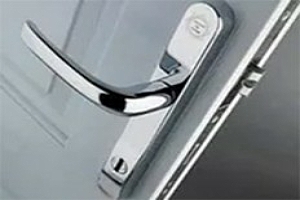 Fortunately, there are low or rebated options which keep the threshold at a very low and easily accommodated height or they can be fitted to be flush with the floor level. Bear in mind that you will need to ensure that the version you are looking at has been fully tested against wind & water penetration. You may also need to think carefully about using flush thresholds if your garden area is subject to flooding or has a lot of standing water that could come into the house. Why fit uPVC Bifold windows or doors? Timber and aluminium bifold doors are themselves very good products, but in terms of this article, let us focus on the most popular material in use at present, and that is uPVC. Availability: Also because there are many suppliers it’s relatively easy to be able to find the type of product that you need. Also the number of installers around the UK is quite plentiful so wherever you live there could be a local company with just the product you want. Life-span: uPVC is a long lasting material that can take a hard life and still retain its’ appearance and function effectively for decades, with a minimum amount of maintenance. UPVC is also a very stable material and is non-reactive to most air pollutants. Long periods of wet or dry weather don’t make it shrink or swell up. Maintenance: It’s worth repeating that uPVC does not take a great deal of your time and effort to look after. Keeping the frames clean and lubricating the moving parts is really all you need to do. Of course, unlike timber, you won’t have to re-paint a UPVC product. Energy efficiency: As a natural insulator, uPVC is perfect for use in the manufacture of bifold frames. Unlike aluminium, there are no complex thermal breaks needed to separate the outside form the inside. The simpler things are, the less there is to go wrong or break. Colour choice: To be fair, you can get way more colours in aluminium designs than Upvc, and you can paint timber any colour you like. 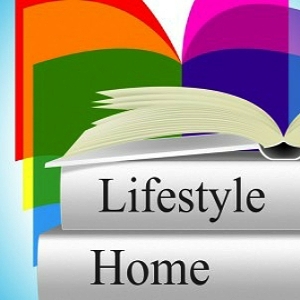 But with up to 20 different options in the market, it is unlikely that you won’t be able to find a door or window to sit your circumstances. 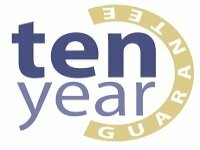 Guarantees: The warranty or guarantee for uPVC bifold doors is just as good for those on timber or aluminium products. Glazing options: Typically, a uPVC bifold window or door will be double glazed, but you can enhance them by the use of solar control glass (low-e), triple glazing or even use laminated glass. 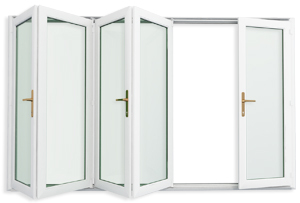 Full length glass bifold doors should use toughened tempered glass as standard. 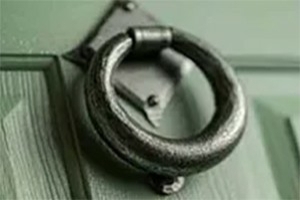 Manufacture, delivery & installation: Once again, because there is a plentiful supply of manufacturers and installers, you are unlikely to have to wait ages for your window or door to be made, delivered and fitted. How much do uPVC Bifold windows & Doors Cost? This section comes with the usual caveats (excuses!) in that prices for home improvements are always specific to the individual project and what is shown below is just a rough guide to the kind of prices in the current market. These price ranges in some cases are for supply only – however, you could allow around £350 to £500 for professional survey & installation. Average bifold window prices are very hard to find online, so as an additional rough guide, a bifold window can be priced around £100 to £150 per panel less than a bifold door (depending on the actual panel size). 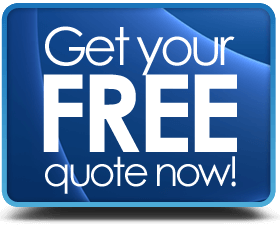 Always get a written quotation from an accredited professional. 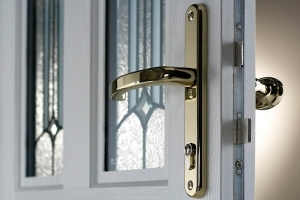 Fully Fitted Composite, Aluminium or UPVC Doors Nationwide – all by certified CERTASS ~ FENSA installers.